Many household products are hazardous for children, but a new study shows the rising threat of this one. It may be time to do a clean sweep of your laundry detergent pods. A new study published in the journal of Pediatrics showed that between 2012 and 2013 over 17,000 children were reported to poison control centers due to ingesting or squirting the packets in their eyes—that amounts to one child per hour. Of the kids exposed, almost 74 percent were under the age of three. About 6,000 of the incidents were seen in emergency rooms, of those, 750 were admitted to the hospital—half required intensive care and at least one case resulted in death. The pods, which came on to the market in 2012, pose a more serious threat than traditional liquid or powder detergent, according to the American Association of Poison Control Centers. When children swallow traditional laundry detergent, symptoms typically result in little more than a mild stomachache, but exposure to the highly-concentrated detergent pods has led to excessive vomiting, wheezing and gasping for breath. 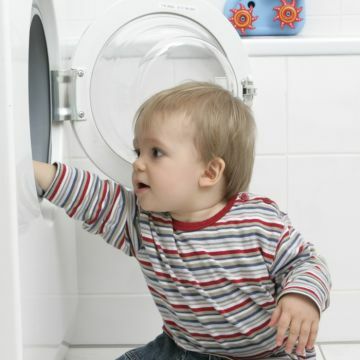 "The pods contain enough detergent for an entire loud of laundry," says Dr. Gary Smith, co-author of the study and director of the Center for Injury Research and Policy at Nationwide Children's Hospital in Columbus, Ohio. "That means that children who put them in their mouths risk swallowing a large amount of concentrated chemicals." It doesn't help that the packets, which dissolve easily, can also resemble a toy or teether, and have a pleasant scent. "The detergent pods are small and often colorful, and may look like candy or juice to a young child," said . "Some of the pods come in zip-top packaging that may look like the kind of bags that snacks are kept in." The pods are such a danger that Smith recommends parents of small children avoid buying them -- and stick with traditional laundry detergent. But regardless of what you use, here are some tips for keeping your kids away from hazardous chemicals. Keep risky items far from little hands. Cleaning products of any kind should be locked up and out of reach of tiny tots, said Kristina Hamm, health education and outreach program coordinator for the California Poison Control System, citing the organization's top tips for poison prevention. Study all the ingredients in your arsenal of household cleaners and if you aren't sure if something's harmful, visit the American Association of Poison Control Center's website or call them at 800-222-1222, said Dr. Deborah Gilboa, a family physician in Pittsburgh, Pa. You can call the center to ask questions and get information—it's not just for emergencies. Go on a label binge. Baby might not know that a sad-faced sticker means stay away full of toxins, but other adults in the house will, and it will help ensure they keep that item tucked away somewhere safe and serve as a reminder to take extra care not to leave it around, Gilboa recommended. Don't keep cleaners in the same place as food—it's easy to get them mixed up, Hamm said. And all household cleaning supplies should be kept in the containers they came in—never put them in a food or beverage container, like a cup.